Mrs Hayley Doyle is a highly-regarded leader of our school and was appointed in 2017. Mrs Doyle is very approachable and encourages an open-door policy for any parents or new families. She is highly professional in her role and very receptive to new ideas or concerns. Her calm and thoughtful approach will ensure that you are listened to, and supported in all aspects of school life at Swan Hill Primary School. Mrs Doyle speaks very well at our school assemblies and events, and proudly represents our school on all occasions. Mrs Doyle has been heavily involved in the leadership team since coming to Swan Hill Primary School 11 years ago. Her passion is around literacy and the improvement of our teaching and learning skills in this area. 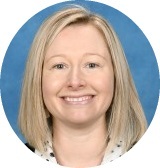 She has been a valued member of the Swan Hill Network Literacy Improvement team, and always contributes to teacher’s professional learning across our Network of schools. Mrs Doyle, whilst on maternity leave, completed her Masters in Educational Leadership. She applies and shares this knowledge during our staff and professional learning meetings on a regular basis. In 2010, Mrs Doyle was appointed to the Assistant School Principal role at our school. Her role was centred on staff coaching, teaching and curriculum learning, staff professional development, student wellbeing and behaviour. She continues to support our leadership team with many of these roles in her new position as Principal. With such a comprehensive and impressive teaching history, we are very lucky to have Mrs Doyle leading our school!